Rixty and Microsoft form a partnership that allows people to turn their change into Xbox Live gift cards. Change builds up fast over time and doesn't do much in small amounts. Kiosks like Coinstar let you deposit your bags of change and receive something more useful like a gift card. Payment platform Rixty and Microsoft have announced a partnership to provide Xbox Live gift cards and Gold memberships through distributors like Coinstar and Great Lakes Scrip Center. 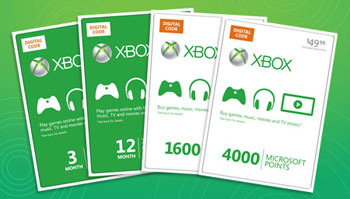 Any company interested in dispensing Xbox Live and Windows Phone Store codes and gift cards can partner with Rixty. "Rixty is already an established alternative payment platform for online games, and we're proud to be selected as one of the few approved Xbox Live Gift Card and Gold Membership wholesalers," Rixty CEO Ted Sorom said in a press statement, Polygon reports. "By expanding our channels to nontraditional resellers, such as loyalty and incentive programs, we're giving these partners access to lucrative new products and consumers more convenient ways to obtain their favorite entertainment content." Rixty's Xbox Live gift cards are available from $5 to $100 and can be redeemed on any Xbox console or in the Windows store. Coinstar is available in many grocery stores in the U.S. When using Coinstar for Xbox Live currency, select Xbox Live, deposit coins, and select the option to receive a gift card or e-certificate. Coinstar also allows you to donate your change to charity. Great Lakes Script Center is a distributor like Coinstar in which it sells gift cards to non-profit organizations' members in bulk. Coinstar will take a fee when converting change into cash but does not do so when converting change to a gift card. Coinstar also works with reloading prepaid debit cards, Paypal, and gift cards for many stores, including GameStop and Amazon.